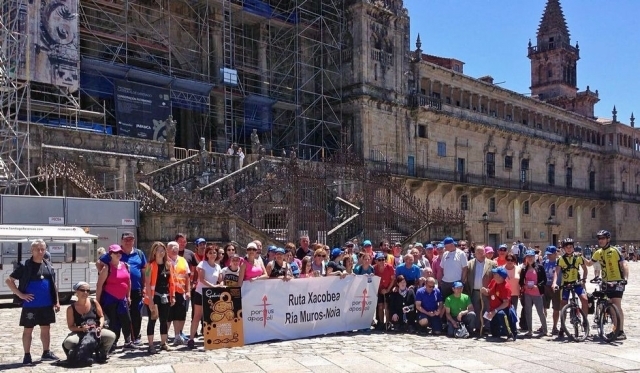 The group of Friends of Santiago do Camiño Muros-Noia continues vindicating the officialdom of this route, this time in the Galician capital itself, Santiago de Compostela, after reaching the Plaza del Obradoiro after four stages. About a hundred people came yesterday at the foot of the famous Cathedral, achieving the target again, make their demands were known by more and more people and pilgrims. The officers of Muros-Noia route is one of the demands that are reaching more dimension in recent days. The group claims that will continue to organize events and mobilizing residents and pilgrims until the route becomes a variant of the English Way. Some of the authorities of the municipalities through which the route passes decided to support, along the way, the organizers and participants in this claim, as in the case of Rois. The pilgrims arrived this unofficial route to Santiago with the shell of a cockle, emblem of his claim and a symbol of Noia.